Four of Indium Corporation's technology experts will be presenting their technical findings at SMTA International (SMTAI), October 24 – 28, 2010, in Orlando, FL. Dr. Lee is presenting two papers: Selection of Dip Transfer Fluxes and Solder Pastes for PoP Assembly, co-authored with Yan Liu, Ph.D., Pamela Fiacco, and Derrick Herron, Indium Corporation; and Testing and Prevention of Head-In-Pillow, co-authored with Yan Liu, Ph.D. and Pamela Fiacco. Dr. Lasky is presenting a paper, Applications of Solder Fortification® with Preforms. Dr. Lasky is also chairing a session for Alternate Lead-Free Alloys: Materials and Processes. Chris Anglin is presenting a paper he co-authored with Ed Briggs, Indium Corporation, called Specification Limits Review for Solder Paste Stencil Print Inspection (SPI). Tommy Acchione is presenting a paper he co-authored with Mario Scalzo, Indium Corporation, called Room Temperature LED and D-Pack Type Component Attach and Reliability Testing. In addition, Chris Nash, Technical Support Engineer, will co-chair a session on Lead-Free Wave Soldering Processes for Today's Challenges. Indium Corporation is also exhibiting at the Electronics Exhibition at booth #415. 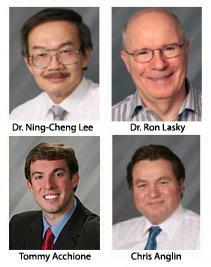 Dr. Lee is a world-renown soldering expert and an SMTA Member of Distinction. He has extensive experience in the development of solder pastes, fluxes, high-temperature polymers, encapsulants for microelectronics, underfills, and adhesives. His current research interests cover advanced materials for interconnects, and packaging for electronics and optoelectronics applications, with emphasis on both high-performance and low-cost of ownership. Dr. Lee is also a member of the SMTAI planning committee. Dr. Lasky, holder of the prestigious SMTA Founder's Award, is a world-renown process expert and an Instructional Professor at Dartmouth College. He has over 25 years of experience in electronics and optoelectronic packaging and assembly. He has authored or edited five books and numerous technical papers and holds several patent disclosures. Dr. Lasky also authors a technology blog, which can be found at http://www.indium.com/drlasky. Tommy Acchione is experienced in the field of nanotechnology and advanced materials and processes, such as carbon nanotube composites and thin film deposition and characterization. He has authored technical papers on nanocomposites and thermal management using NanoFoil®. Tommy has a bachelor's degree in Materials Science and Engineering from the University of Pennsylvania. He is a member of the Society of Vacuum Coaters (SVC) and the International Microelectronics and Packaging Society (IMAPS). Tommy also authors a blog on nanotechnology. SMTAI is a world-class electronics manufacturing conference and exhibition organized by the SMTA — the world's leading user group for surface mount and companion technologies. This comprehensive event features over 100 technical papers, 24 tutorials, an Alternative Energy Symposium, and three focused symposia across six tracks: Manufacturing and Assembly, Advanced Packaging, Substrates, Soldering, Process Control, and Contract Manufacturing/Business Issues.